And then it was over. The Six Nations tournament council met yesterday and decided not to change the format for the women's rugby tournament down to two-tier contest. 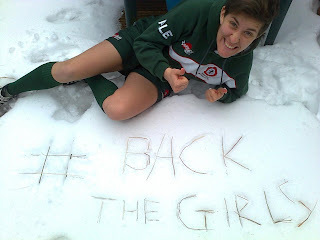 It's probably not too far a stretch to say social media especially information fed through women's rugby-site Scrum Queens played a significant role in this decision. Watching Twitter fill up with support for the women's teams was very heartening to this cynic, not to mention a number of articles in newspapers in all six countries. So we have another exciting tounament to look forward to next year, and perhaps all of this extra attention will bring a few more players into the club leagues as well. Coverage of yesterday's meeting here and here.